A garden inspired by the resilience, determination and ingenuity of refugees living in Domiz camp in Northern Iraq, will be unveiled at the 2018 RHS Chelsea Flower Show. The Lemon Tree Trust garden, designed with the input of refugees, highlights the unexpected beauty hidden in the camp. The garden is inspired by the resiliency and determination of people in situations of forced migration and displacement. Their ability to make the most of harsh living conditions and landscapes, and their dedication to create gardens and beautify their limited personal space is profoundly inspirational. The garden will be used as a space to begin to organise the chaos inherent in forced migration, while also providing a sense of normality, wellbeing, peace and civility to broken lives. The garden is designed to support refugees displaced within Domiz camp in Northern Iraq by broadening our message to the public. Refugees seek ways to bring order to a chaotic situation, as well as a space to come together as a community and to learn about horticulture and water retention. Beautiful yet drought tolerant planting educates visitors about the type of plants and crops they can grow on their own plots. Ingenious vertical planting, inspired by refugees’ use of everyday objects, and including input from refugees themselves, provides ideas for planting in limited spaces. Trees laden with fruit, including figs, lemons and pomegranates, provide scent and crops to harvest. Brutal, harsh materials, such as concrete and steel, widely available in the camps, are made beautiful with techniques such as polishing, casting and crafting into patterns and intricate Islamic inspired designs. Colourful and textural planting softens the hard materials. Cooling and calming water flows throughout the space, collected in channels and pools, recycled and pumped back through the brimming central Islamic inspired fountain, representing the importance of greywater reuse in the camps and the many makeshift fountains refuges have built in their own gardens in Domiz camp. Tom Massey progresses to the RHS Chelsea Flower Show, with a 10x13m Main Avenue garden, after two successful show gardens at RHS Hampton Court Palace Flower Show. The garden will be built by multiple gold medal winning contractor Landscape Associates. Tom Massey is supported by Dr Sami Youssef. Dr Youssef is a Syrian refugee who previously lived in Domiz camp and now resides in France. Sami is a biodiversity expert and has been an invaluable source of information and assistance with regard to the plants chosen for the garden. 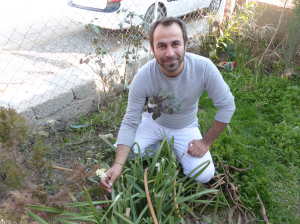 Image: Dr Sami Youssef in his home garden, Domiz Camp, 2016.